The annual Family of the Year competition recognizes a family that has shown great dedication to the K-State community and Wildcat family. Selected by a committee, the Family of the Year is hosted for special activities during K-State Family Day. The recognition is sponsored by Chimes Junior Honorary. The selected family was recognized as the Family of the Year during the 2017 Family Weekend. 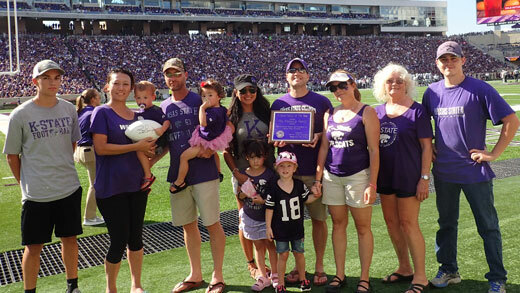 The family was introduced on the field at the home football game, announced through various media outlets, and were guests of Chimes Junior Honorary and the K-State Student Union at an honorary brunch. The family was presented with an engraved plaque. Applications are due on Friday, August 24th at 11:59pm.